2 OWNERS, F/F/S/H, SAT NAV, SUNROOF, HEATED/COOLED SEATS. 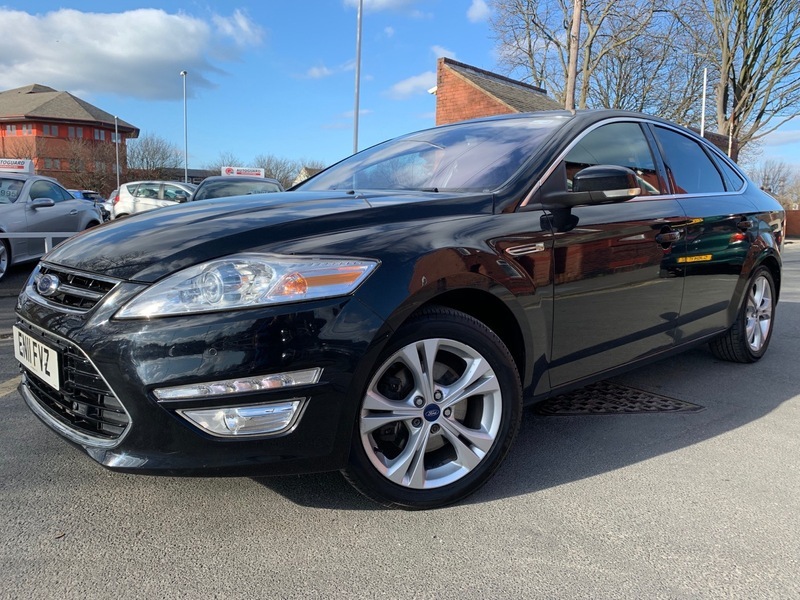 WOW WHAT A FANTASTIC EXAMPLE THIS IS OF THE FORD MONDEO, ITS A 1.6 TDCi ECONETIC TITANIUM X WITH A MEGA SPEC, 2 OWNERS WITH FULL FORD SERVICE HISTORY, FINISHED IN PANTHER BLACK METALLIC WITH HALF BLACK LEATHER/SUEDE UPHOLSTERY WITH WHITE STITCHING, A FANTASTIC SPEC WHICH INCLUDES, REMOTE KEYLESS LOCKING/START, PAS, ABS, ELECTRIC WINDOWS ALL ROUND, ELECTRIC ADJUSTABLE AND FOLDING MIRRORS, DUAL ZONE DIGITAL CLIMATE CONTROL AIR CON, ELECTRIC TILT/SLIDE SUNROOF, COLOUR TOUCHSCREEN RADIO CD PLAYER/SATELLITE NAVIGATION SYSTEM, FORD CONVERSE+ SYSTEM, BLUETOOTH PHONE SYSTEM WITH BLUETOOTH AUDIO, AUXILIARY/USB INPUT MP3 PLAYERS, HEATED AND COOLED SEATS, AUTO LIGHTS AND WIPERS, MULTI FUNCTION STEERING WHEEL, CRUISE CONTROL WITH SPEED LIMITER, MULTI FUNCTION TRIP COMPUTER, FRONT AND REAR PARKING SENSORS WITH REVERSING CAMERA, PRIVACY GLASS, REAR SPOILER, ELECTRIC HEIGHT ADJUSTMENT TO DRIVERS SEAT, ALLOY WHEELS. A WONDERFUL EXAMPLE NOT TO BE MISSED.